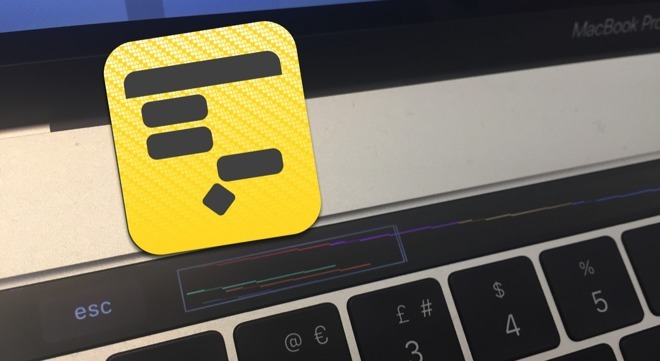 Recent Omni Group project management tool OmniPlan has always been one of the best tools for Gantt charts, but the 3.6 update makes good use of the new MacBook Pro's Touch Bar as well. AppleInsider examines the new offering. If you're forgetful, you need a Reminders list like the one provided on macOS and iOS. If you're busy, you need a To Do manager like OmniFocus. However, if you're really busy on very complex projects with lots of moving parts, you need project management software like OmniPlan. This new update adds well-done support for the latest Apple technology, plus the regular raft of general improvements with any new software point update. The standard for project managers is actually Microsoft Project but that doesn't exist on Macs or iOS. It's also confusing —and unnecessarily so. Project management is inherently bewildering because of the need to track dozens, hundreds, thousands and millions of components, staff and resources. Microsoft makes it hard for you to even figure out how much MS Project costs. OmniPlan is significantly clearer than Project, in every regard. This doesn't mean you'll buy it today and start planning the next Hoover Dam tomorrow. However, it does mean that you'll enjoy using it more than you would the tools from Redmond. As with nearly all project management apps, OmniPlan defaults to showing you Gantt charts. These have all your tasks as blocks whose width shows how long they're expected to take. For instance, those tasks can be linked together so that you know you can't book a builder before you've got planning permission. When you have lots of steps, you can also have more than you alone can do. In that case, OmniPlan also tracks any staff or help you have. It keeps a track of all resources. So if you only have use of a cement mixer for half a day next week, that goes in the plan. As most major projects have long durations and comparatively few steps or resources, Gantt charts tend to be wider than they are deep. The Touch Bar support helps with that. Touch Bar support is a minimalist, unobtrusive addition: you don't require a MacBook Pro with this feature in order to use and benefit from OmniPlan. If you do have one, though, you will instantly take to it. —click anywhere in your project and the Touch Bar changes to display a miniature graphic of the entire thing. It's very similar to how Final Cut Pro X looks with its timeline: you see your whole project and can drag left and right across it. This is a small thing, but so handy that you forget you haven't always had it —which is the supposed goal of the Touch Bar anyway. When you're anywhere else in the app such as in the list of tasks, the Touch Bar changes to offer common tools such as marking all tasks as done. There's also one button for effectively saying, "okay, nothing's been done yet so move every task forward to begin today." Most of the other new features in this update are bug fixes or improvements to how information is displayed. You end up with a huge amount of information in a typical project plan. As a result, even small improvements have an impact because you're using every part of OmniPlan constantly. 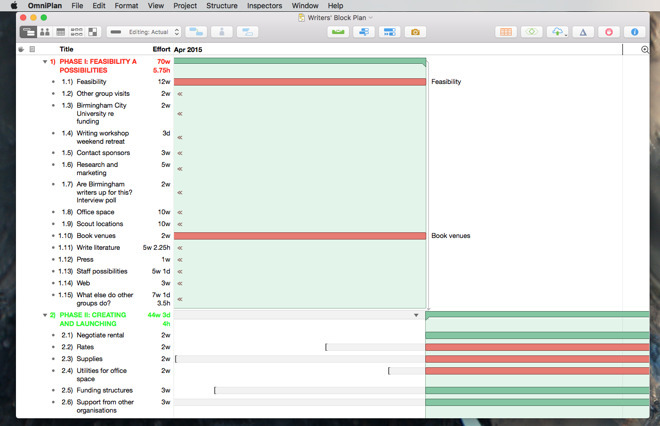 OmniPlan was always good for showing the whole picture of a project. Since the release of the iOS version it's been good at showing you the whole picture wherever you are. Now with the handiness of the Touch Bar there is a small question mark over the iPad version. You could now more easily get away with just the macOS Sierra version and a light 13-inch MacBook Pro. The ubiquity of OmniPlan is important, though. The ability to have it on your MacBook Pro, your iPad, your iPhone, and your iMac mean it's always available to you. Despite the application's pedigree and ubiquity of Gantt charts, If you can, it is best to stick within OmniPlan for all of your project planning rather than mixing and matching apps. If you're a Mac user in a PC company then in theory you can readily import Microsoft Project documents into OmniPlan and export back. However, while the Omni Group keeps updating this import/export, we've hit occasional snags with trying to round-trip between OmniPlan and MS Project. What would be more useful would be to leverage features from other Omni Group products. Since you can assign tasks within OmniPlan to one particular person, it would be great to be able to export their tasks with no friction over to their copy of OmniFocus. Similarly, being able to import an OmniFocus To Do list would go some way toward making entering a project's tasks easier. As it stands, you type a long list directly into OmniPlan and can drag things around or insert extras. It's the slowest part of setting up a project. This is especially galling when the company sells OmniOutliner, an outlining app that is much faster and capable for entering long lists. OmniPlan is not a quick fix or casual app, though. It is a very robust and functional tool that's meant to work with you over the days, months or even years of significant projects. It will take you time to learn but it rewards the effort. Alongside this new update to the software there is an improved user manual available on the iBooks Store. There are also many books on using and exploiting Omni Group software. Note that OmniPlan 3.6 for macOS Sierra comes in a Standard version for $149 and a Pro kit for $299. If you need project management software, you tend to really need all of it, so we'd recommend going straight for Pro. We're also recommending that you buy directly from The Omni Group. This is because historically the company has been able to offer free trials and better upgrade deals directly. From this version on, though, OmniPlan is available in a two-week free trial from the Mac App Store.